Recycling has been a key element in daily life lately. People produce tons of waste everyday and it is vital to limit damages caused to the environment by the waste. Some are more dangerous than the others, like fluorescent lamp. Recycling fluorescent lamps should be done thoroughly and carefully so that it does not bother the environment but it does good for it. Fluorescent light tubes and ballets are considered as hazardous wastes. They are then subject to specific controls from the moment it is handled, packaged, transported and disposed. Did you know that one fluorescent tube can contaminate approximately 30,000 liters of water? Containing 94% glass, 4% ferrous and non-ferrous metal and 2% phosphor water, this lamp is too dangerous to be just thrown away to the landfill. Recycling is therefore essential for this type of waste. Handling and packaging the lamps carefully before sending them to a recycling company is very important. One of the containers that can be used is fiber drum. Why fiber drums? Because it is environmentally friendly and cost effective. These cylindrical containers are manufactured from sturdy fiberboard. Below are some tips to do when handling fluorescent light recycling at the packaging stage with fiber drums. Fill each drum with only one single diameter lamp. Do not mix lamps of different diameters in one drum. For linear fluorescent lights, place them vertically; but for U-Tubes and compact fluorescent lamps, put them horizontally that it ensures more stability. Do not force lamps into the drum when it is already full. Breakage may happen if the lights are packaged too tightly inside the fiber barrel. Use paper, cardboard or bubble wrap to separate one lamp from the other to prevent any breakage. Use these materials to fill in the unused spaces in your container. When ready, apply the lid and secure with tapes. 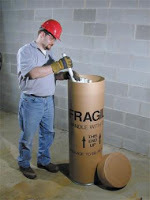 Bay Tec reusable fiber drums are designed especially for handling fluorescent lamps. With metal chime and polyseal on the bottom, they provide extra strength and moisture resistance. There is also a special order label area where the labels can be removed without damage to the drum. There is a clear print on the drums to create handlers to put more care and return the drums after use. For more info on the sizes and prices, visit this page. I was looking for drum equipment and found post, its really nice blog. Thanks for sharing.